This weekend we hosted our 2nd Annual “Squish Your Squash” gathering of awesome people. What’s that you say (go ahead and say it, I’ll wait)? 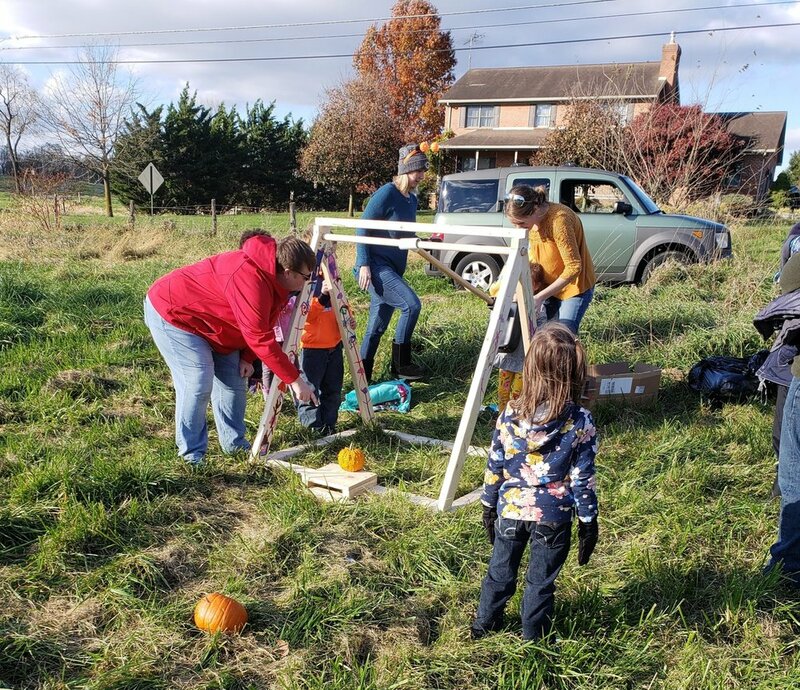 Well it is a gathering of people to take leftover Halloween pumpkins and other produce and create ways to squish, squash and otherwise destroy them. It is a total blast. A few years ago I binged watch the Pumpkin Chunkin championships and was so inspired and greatly amused. I pondered hosting a gathering for a few years and then last year I was challenged to actually do it and it was amazing. I have to say that this event makes me so happy and so inspired. When I sent out the invitation last year I was nervous that no one would make anything and that they would think I’m a complete dufus. So you must understand that when my friends took the challenge and created amazing devices I was completely over the moon. This year was just as awesome and I thought I would share some of their awesomeness (yes I said awesome twice in one sentence). Catapults are the most popular made devices. This year we had two that were powered by bungee cords and two that are human powered. One of them was an adorable but mighty catapult made from a tool table of some kind. 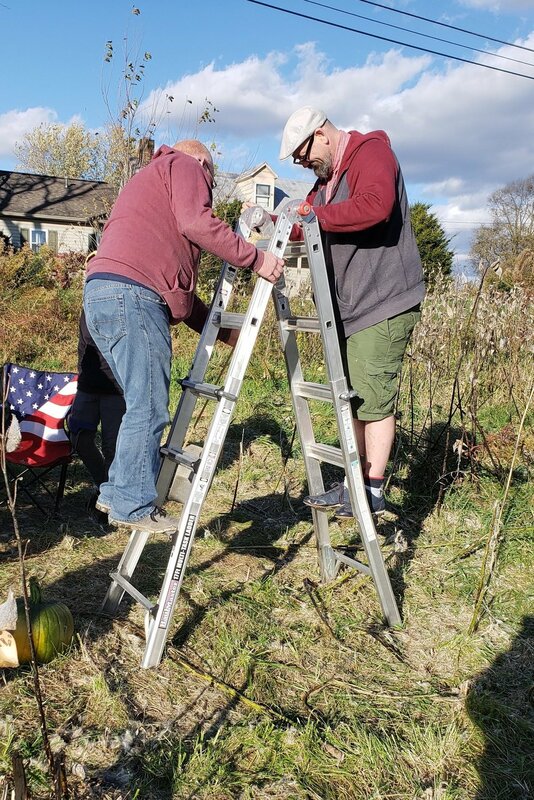 It was a back up plan for my friend David and it flung little pumpkins so far. Our own device is a catapult that is an old board attached to a step ladder and has a metal bowl attached to the end. I admit that ours is a little dangerous if you don’t push hard enough. A helmet would probably be a good addition to ours. The Pumpkinator at work and the looks of joy. 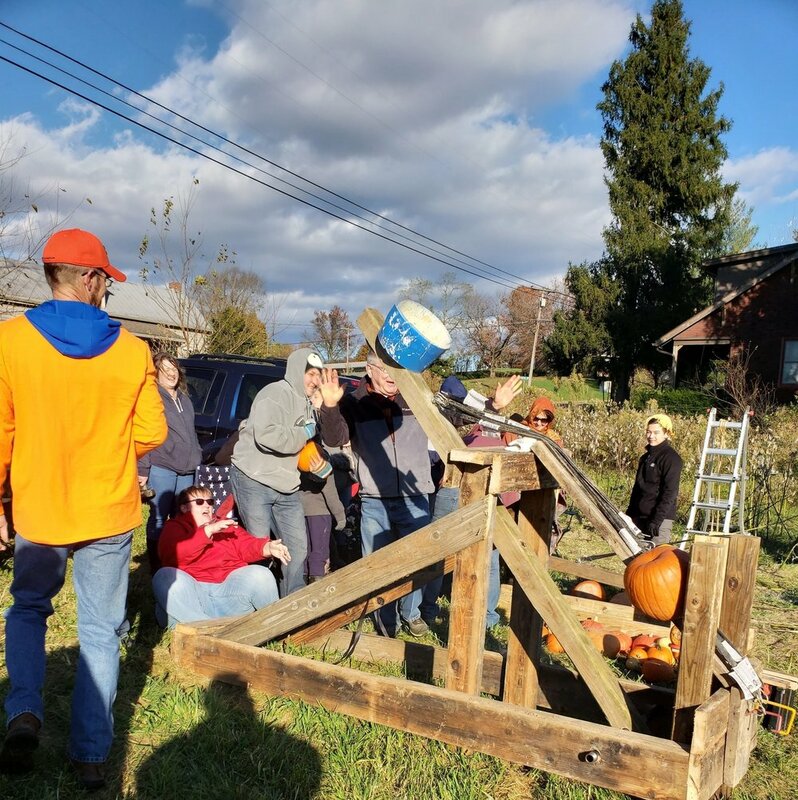 These devices relied on a heavy object being swung into the pumpkin for it’s smashing. We had two of those this year. One was a cinder block on a rope hung from a ladder. It was smashingly good. The other one was called the booty and it was a wood block with a pipe inside that you swung into a pumpkin and tried to get it onto a target that was spray painted on the grass. It was like pumpkin chunkin met curling. I admit this was probably my favorite. It made a satisfying thunk when it hit the pumpkins. The Booty about to boot a pumpkin onto the target. The ladder and cinder block pumpkin swing. It made such a good thunk. One of the reasons I call this party “Squish Your Squash” and not pumpkin chunkin is because I wanted people to not feel like they had to make a complicated device. They could just show up and smash some pumpkins for fun. We had that in full force. A couple of our younger friends showed up with a hammer and hammered the heck out of their jack o’lanterns. They were very dedicated to the cause and I loved it. My brother also had a sling shot that I worked with smaller pumpkins. Finally we had lots of people just manually squishing pumpkins and pumpkin pieces with their feet which was really satisfying. Meet this years winner! My other brother made a trebuchet and it was pretty amazing. He engineered this during the week. It took a few tries to find the right pumpkin combination, but once he did it was both impressive and slightly terrifying. It was really great and a well deserved winner. The trebuchet being prepped to launch. I love this day so very much. First, I love people I adore coming together for any reason. Second, I am obsessed with the maker movement and I just am inspired to see the things people dream up come to life. So much thinking and engineering! Finally, I just love absurdity and this scratches that itch. When you think about it, this is really so wonderfully silly and fantastic. Dear Reader, I hope you enjoy the creativity and joy that we had here at Marsh Farm. Please check in next spring and summer for updates on the pumpkin patch.